Most business leaders realise by now that the speed of everything is accelerating. They might still have five-year strategic plans, but there is constant pressure on them to move towards shorter planning cycles and continuous iteration of their plan. This dovetails neatly with the emergence of DevOps, which is all about rapid and continuous IT delivery – with software being released as soon as it is ready. Businesses that embrace DevOps as part of their IT architecture are able to respond more effectively to a fast-changing operating environment, becoming more nimble and responsive in the process. There’s also some intriguing anecdotal evidence that DevOps-friendly businesses have been outperforming the financial markets. Most observers would agree that Facebook leads the charge here. Its DevOps-style approach permits an accelerated development cycle which means that user friendly developments such as bi-weekly app updates are raising the bar for brands everywhere. Many businesses are shifting towards the creation of Minimum Viable Products, and an expectation that they will bring new innovations to market as fast as possible. Among these forward-thinking firms, rigid innovation processes demanding heavy documentation have widely been abandoned to enable innovators to get things done fast. This mirrors the DevOps approach in IT – where DevOps allows IT departments to streamline their way towards software delivery that happens without bottlenecks or hindrances. It is proving incredibly effective for even the most complex of businesses – a case in point being Live Nation, the event organizer which also owns Ticketmaster. With a target to connect with one billion fans by 2020, DevOps is helping the company deal with sudden surges in demand, fight off competition, reduce self-inflicted business disruptions and incidents and speed up the deployment of innovative iterations. Meanwhile over at Nike DevOps is allowing the company to tackle its e-commerce logjams. Automating processes is the key driver of more cost-effective, efficient workflows, with sectors as diverse as accounting, supply chain management, manufacturing and sales and marketing increasingly embracing automation. A strategic commitment to DevOps can support the drive towards automation because DevOps is powered by automation. With DevOps, the aim of the IT organization is to use automated tools e.g. in testing software to achieve cost and time efficiencies while creating ready-to-go software. What’s more, the shift towards DevOps is significantly enabled by cloud platforms such as AWS and Azure, which have driven the adoption of automation and efficient tools. All of this eliminates unnecessary work and allows IT people to focus more on creativity. From the business perspective, this means more value per ‘IT hour’. This value isn’t just theoretical, it’s delivering tangible business benefits. Take online marketplace Etsy, regarded as a poster child for DevOps. Etsy replaced internal silos and barriers with a dialogue-based approach that has enabled it to scale rapidly. Meanwhile, Adobe has used DevOps to streamline processes and achieve tangible business benefits such as faster software delivery, fewer silos, and better management across products. Since embracing DevOps, Adobe has been able to accommodate 60% more app development demand. With DevOps, culture and people trump processes and tools. 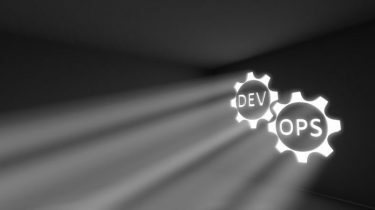 Collaboration between operations people and developers is the norm, with DevOps teams aligning their work at least daily so that potential integration issues in software can be spotted immediately. Furthermore, DevOps nourishes autonomous teams that take responsibility and get things done fast. As such, business leaders who export DevOps culture to other areas of their business can expect to unleash a culture of collaboration, autonomy, and continuous learning. Retailer Target made a $5 billion bet on DevOps in 2015 and is generally acknowledged to have reaped the rewards of taking a DevOps mindset company-wide. The company, which holds DevOps days for departments outside IT, created an accelerated learning environment called “the Dojo” where teams execute their normal work with the support of agile coaches. Financial services is another sector where DevOps is helping traditional banks address the challenge of fintech, challenger banks, blockchain, and cryptocurrencies. Lloyds Banking Group, for example, has used DevOps to drive community and collaboration among engineers and “get rid of the stereotype of banks being locked down and forbidden”. Business leaders are keen to know that their operations are functioning as planned and like to be alerted quickly to any issues. To this end they deploy KPIs and metrics to provide relevant data and make interventions where necessary. Similarly, DevOps involves numerous releases of new software which need to be constantly checked. As a result, one of the central tenets of DevOps is continuous monitoring, so IT teams can spot errors and fix them in real time. It’s a rigorous attention to detail which ensures that, if there are any errors in the software, they are corrected quickly so customers and users stay happy and engaged. Netflix created a suite of automated tools called the Simian Army, which neatly illustrate the point. By testing the streaming platform’s infrastructure, Simian Army tools highlight and fix any problems before they can impact customers. Shared more widely within an organisation, this can drive a proactive approach to problem solving. To summarise, DevOps isn’t just a modern approach to IT. Linked to broader business strategy, DevOps can drive significant brand value by accelerating speed to market, ensuring better checks on existing systems and processes and in hiring new talent. Businesses interested in being future capable – that is, remaining competitive and relevant in tomorrow’s market – should prioritize integrating DevOps ideology and ways of working into the wider business.